Last week I had the good fortune to celebrate 5 birthdays in one day. As with most birthday celebrations, they involved food. In addition to all the birthday cake (and one birthday flan complete with candles) there were a lot of delicious birthday meals. By the end of the day I’d eaten so much that I was completely stuffed. Sounds great in theory, but I didn’t use my common sense to say “no” to all the yummy birthday treats so I ended up paying for it by spending the next day nursing a roll of Tums. Friends and family aren’t the only ones who help you to celebrate your birthday. 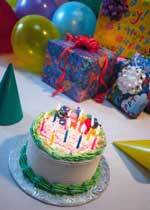 Businesses and restaurants often have freebies for you to help you celebrate when you join their birthday clubs. One musician, David Was, decided to spend his 60th birthday eating birthday freebies. His day started at 5:00am for the free Grand Slam Breakfast at Denny’s. This included: pancakes, grits, eggs, and hash browns. Lunch was a free Chipotle cheesesteak sandwich and a free drink at Jersey Mike’s sub shop. His dinner was a free Famous Dave’s BBQ beef brisket platter. This “caloric juggernaut” was cash-free but also low roughage, causing David to start his 60th year with unbuttered wholegrain toast and carbonated spring water for the next few days. Bottom line is there is no such thing as a free lunch. However, if you gorge on free legal forms instead of balancing your legal diet with solid legal advice, you may not realize you’ve had too much until it’s too late. If that happens you could end up with some serious problems that won’t be cured by a roll of Tums or a wheat toast breakfast. Like freebie birthday foods, a freebie from a lawyer or an Internet legal service is meant to be a “taste” so you know whether you’d like to come back as a consumer. It’s not supposed to be diet staple. It should be taken in in moderation. Want to get your free legal sample? Come to a Free Legal Forum (dates of upcoming Forums are listed in the left box of this email). At Free Legal Forum, Tisha will answer legal questions for free until time is up. Contact us for more information.